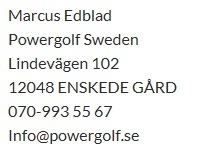 Welcome to Marcus Edblad Golf. The last ten years I have helped golfers understand and control the ball in a way that they didn’t think was possible. My backround in international long drive will also give you more club head speed, that’s a promise. You are born with a fantastic gift called hand-eye coordination. This skill is very valuble in all of sports. In golf we are trying to take this gift out and do all tough moves with other parts of our body. The only problem with that is that it does not work and that is why we think golf is so hard to do. Your big muscles will always help your hands but they do not control them.I will help you use your own skills that you are born with to make your golf easer and a lot more fun. Be careful, if you try this you will never do anything else. It is that good. Contact me for all other events, clinics and company outings and I will respond with information and prices.